You are here: Home / News / RING IN THE NEW YEAR WITH ANDREW DICE CLAY: INDESTRUCTIBLE! 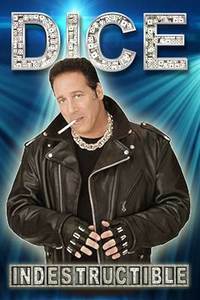 LOS ANGELES, CA – (December 7, 2012) – This New Year’s Eve, the "Indestructible" Andrew Dice Clay returns to television with his first stand-up special in 17 years. Laugh through the last remaining hours of 2012 with ANDREW DICE CLAY: INDESTRUCTIBLE! on Monday, December 31 at 10:00PM ET/PT on SHOWTIME. From the moment he takes the stage to the closing credits, the “Diceman” is on fire. Filmed at the Arcada Theatre in Chicago, Clay takes on everything from racial stereotypes to gay marriage and from sexual exploits to his own aging anatomy. True to his notorious persona, Clay is outrageously shocking and offensive — but always hilarious. “My filth is derived from watching people, whether it be behind a bedroom door, or on a New York City subway,” Clay tells fans and critics alike. “At the end of the day, it’s comedy, it's what I do. If I really did just one quarter of what I say on stage, I’d be doing 25 to life." Adding to its uniqueness, Clay makes this special a family affair: his ex-fiancée, comedienne Eleanor Kerrigan, opens the show and introduces the audience to Clay’s sons, Dillon and Max, and their band "LA Rocks." The band warms up the audience with hard rock anthem, “Outlaw,” written by Dillon and performed live for the first time on film. Clay’s meteoric rise to being the most successful and controversial comic in the world brought great popularity and criticism that ultimately fueled his rocket ship rise to unprecedented heights. For over 35 years, Clay has sold out hundreds of sports arenas across the country, with more than 12 million tickets sold to date. He was the first comic to sell out Madison Square Garden two nights in a row. Clay recently held a recurring role on the final season of HBO’s Entourage and next summer, will co-star alongside Cate Blanchett and Alec Baldwin in Woody Allen’s forth-coming feature. ANDREW DICE CLAY: INDESTRUCTIBLE is presented by LOL Comedy Inc., and produced by LOL Comedy, Inc., in association with DRO Entertainment and Brave Lion. The special is directed and produced by Scott Montoya, and produced by Neal Marshall. Executive producers include Andrew Dice Clay, Scott Montoya, Peter Fruchtman, Jerry Fruchtman, Neal Marshall and Bruce Rubenstein.